Low-cost carrier Vietjet and American planemaker Boeing yesterday closed an enormous order of 100 aircraft worth US$11.3 billion. 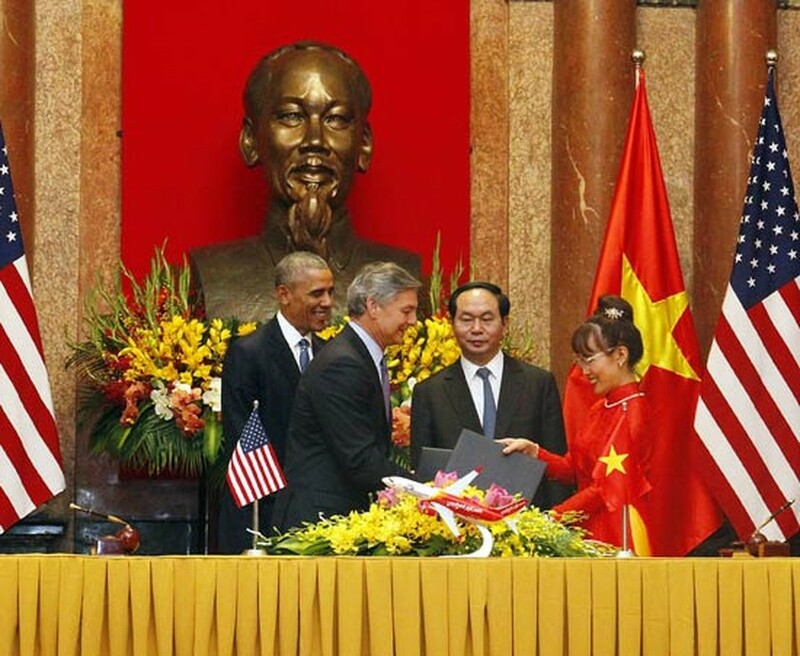 The signing ceremony, conducted by Vietjet President and CEO Nguyen Thi Phuong Thao and Boeing Commercial Airplanes President and CEO Ray Conner, took place at the Presidential Palace in Hanoi, at 11:40 a.m with the witness of U.S. leader Barack Obama and Vietnam President Tran Dai Quang. “Boeing is proud to again play an integral role in advancing Vietnam’s aviation industry. We’re honored to be joined by Vietnam President Tran Dai Quang and US President Obama for this historic milestone and order of 100 737 MAX airplanes,” said Conner. “Incorporating the latest design and technology features, the highly efficient 737 MAX will provide Vietjet’s growing network with market-leading economics, a superior passenger experience and contribute significantly to their future success.” - Mr Ray Conner shared in the event. The 737 MAX incorporates the latest technology CFM International LEAP-1B engines, Advanced Technology winglets and other improvements to deliver the highest efficiency, reliability and passenger comfort in the single-aisle market. The new single-aisle airplane will deliver 20 percent lower fuel use than the first Next-Generation 737s. The airplanes in this purchase will be delivered to Vietjet from 2019 until 2023 for supporting Vietjet to continuously extend the domestic network as well as international network in the region. This agreement helps Vietjet to increase the fleet to more than 200 aircraft in the end 2023 with the most modern and advanced technology in the world.